Product #21332 | SKU 485927 | 0.0 (no ratings yet) Thanks for your rating! 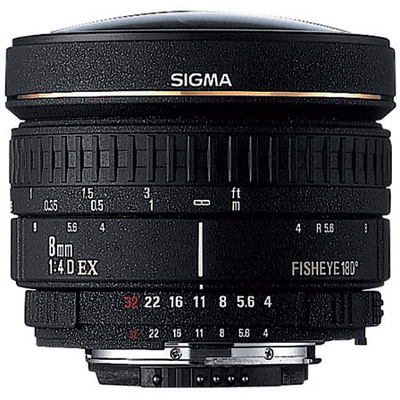 Presenting an impressively unique 180° angle of view, the Sigma 8mm f/3.5 EX DG Circular Fisheye Lens is a creative tool for producing dramatically distorted, circular imagery. Designed for full-frame-format Canon EF DSLRs, this lens intentionally does not cover the full image frame and rather produces a fully circular image in the centre of a black frame. One Special Low Dispersion (SLD) glass element is incorporated in the lens design and helps to reduce some chromatic aberration and colour fringing for increased clarity. The lens also features a close minimum focusing distance of 13.5 cm, along with a 1:4.6 maximum magnification ratio, to enable creative close-up shooting from unique perspectives. An internal focusing design maintains the overall length of the lens during use, and a selector switch allows you to quickly change between autofocus and manual focus settings. One SLD element helps to reduce chromatic aberrations and colour fringing for greater colour accuracy and clarity. Minimum focusing distance of 13.5 cm pairs with a 1:4.6 maximum magnification ratio for creating unique close-up imagery. The lens itself lacks front filter threads but does incorporate a gelatin filter holder at the rear of the lens.